The European Court of Human Rights (ECHR) has rejected a request to find the Hooded Men suffered torture during internment in 1971. Picture by Hugh Russell. Hooded Men Francis McGuigan and Liam Shannon in Belfast yesterday. Picture by Hugh Russell. 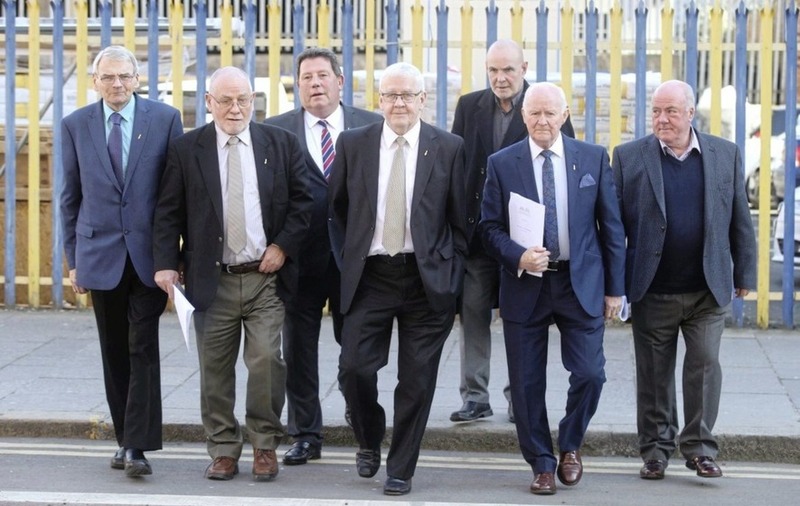 A GROUP of former internees known as the ‘Hooded Men’ want the Irish government to lodge an appeal after the European Court of Human Rights rejected a request to find their treatment was torture. 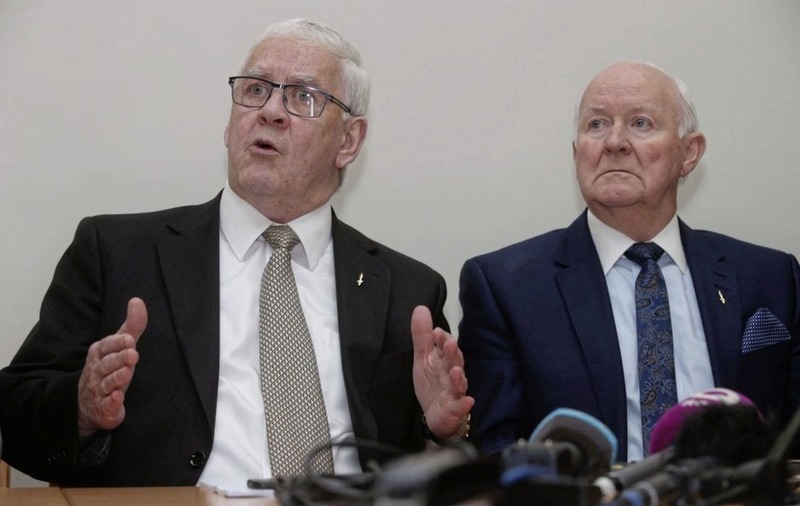 The 14 Catholic men from across the north say they were subjected to state-sanctioned torture when they were interned in 1971. None of the men were ever convicted of any wrongdoing. The men’s legal team, which includes Amal Clooney, the wife of Hollywood star George Clooney, have said they will now challenge the decision. The five techniques used included being hooded, made to stand in stress positions, forced to listen to loud static noise and being deprived of sleep, food and water. In some cases the men were also thrown from helicopters and told they were hundreds of feet in the air despite being just feet from the ground. The ill-treatment was carried out at a British army camp at Ballykelly in Co Derry. In 1978 the European Court of Human Rights held that the techniques constituted inhuman and degrading treatment - but fell short of torture. Other countries including the US and Israel have since relied on the 1978 ruling to defend the interrogation techniques used by their forces. In 2014 the case was referred back to the court with the support of the Irish government. Dismissing the request by six votes to one, the ECHR said there was "no justification" to revise the 1978 ruling. The case was launched after the discovery of new evidence in the British national archives in London. The Irish representative on the panel Síofra O’Leary later issued a dissenting opinion and said her colleagues took an “unduly narrow approach” to the issue. A High Court judge in Belfast last year said that the men’s treatment would probably be viewed as "torture" today. Hooded man Francie McGuigan last night said that after initial disappointment the group want Irish government to appeal the decision. “It is with regret that we learn that the Court has sought to side step this opportunity to correct the grave injustice of the Ireland v UK ruling,” he said. The men’s solicitor Darragh Mackin said their legal team will challenge the decision. “We are also dismayed that the European Court of Human Rights has not taken up this opportunity to uphold the very principles it was designed to protect in this most crucial field of human rights protection,” he said. “Our clients have instructed us to take steps to support a referral of this case to the Grand Chamber of the European Court. Irish foreign affairs minister Simon Coveney said the “ruling will be fully considered by the government”. He said he is due to meet the men in the coming weeks. UUP justice spokesman Doug Beattie last night said: "Many people will now be asking if the Irish government would be prepared to take such a stand for the victims of the IRA."